…is a great idea! If you don’t have the time to do it yourself, get packing services. Or if you have arthritis in your hands, which I hope you don’t. Or if you just, let’s put it this way: ‘dislike’ it. Now, imagine that everything magically appears in your new home, boxed, labeled, ready to be put away. You did not have to lift a finger, yet it’s all done! If this is what you are looking for, ask about your options and your Simple Moves Move Pro will handle it from there. …and have your Simple Moves Pack Pros take care of the unpacking part as well! Your Packers will open the boxes they packed for you, and place the items on flat surfaces, like beds, tables, and shelves. Then, say a last tearful goodbye to the recyclable materials your Packers used, because it will be all gone, leaving you almost nothing to deal with after the move. Simple, isn’t it? …is also a great option, but let us sculpt you into a Packer Pro, first. Decide between rentable plastic totes and cardboard boxes. Simple Moves Pack Pros suggest going with a combination of the two. Pack your fragile, tend-to-leak and last minute items into plastic totes and everything else into cardboard. Are you worried about Mother Nature? Cardboard sounds like tree cutting, but recycling solves that problem. Imagine the plastic tub that will never decay…ever. Be smart when trying to be socially responsive, sometimes the obvious is not so. Pack, literally everything that fits into a box. This is one of the Simple Moves rules: if the item fits in a box, and it is in a box, your Movers’ Crew will move it. Otherwise, someone will either have to pack things on the moving day, or leave them behind. This range of sizes is considered proper moving boxes: 1.5 cubic feet – 5 cubic feet and wardrobe boxes. Anything that fits into these sizes, must be packed. Any item that is larger, your movers will wrap into moving pads. Pack heavy items into small boxes and light items into large boxes. 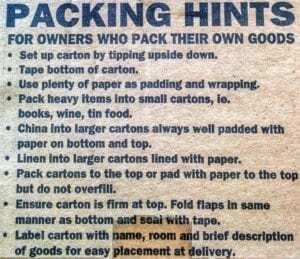 Also, periodically check the weight of the box you are packing. Imagine that your Movers will run up and down the stairs with these boxes, all day and ask yourself: is this too heavy? Chances are, if you can lift it, we can lift it, except if you are a weight-lifting champion. Packing the awkward and fragile items are usually easier to leave to your movers. This is called a partial packing service. We’re ready when you are! China and Crystal, other dishes: Dishpacks (also called China barrels) or 2 cubic feet boxes, placed into larger boxes. video training done by United Vanlines. Notes: These packing videos were made for “long distance moving”, thus the packers use about 2 times more packing paper than what is required on a regular, local move. Thanks! Click to see the whole list.